Pete Gregory, husband of Scentsy Independent Consultant Mary Gregory, demonstrates how to set up your new Scentsy night light Candle Warmer. If you've never set up a night light warmer before, they can be a little bit tricky, but it's really simple. If you'd like to buy a Scentsy night light Warmer, visit our shop page and buy Scentsy right now! It's not hard to set up your nightlight and it should be self explanatory. 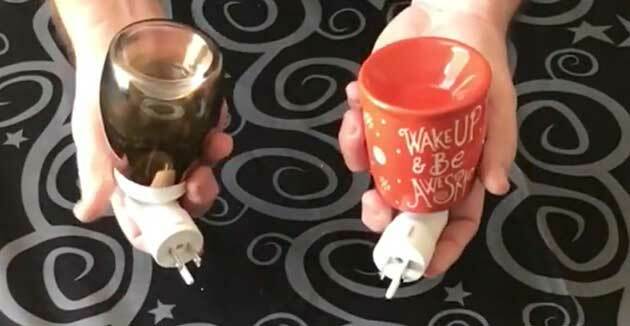 Basically, you just connect the ceramic or glass warmer to the plug and you're all set. There are two types though which is why we are sharing the video above. First, there's not much that can go wrong with an authentic Scentsy night light warmer. Of course, just like any other, the night light bulb will need to be replaced occasionally. The problem is, it's super important to choose the correct wattage bulb, and they can be very difficult to find. 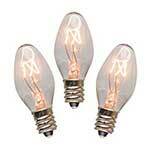 There are other bulbs that look exactly like the one you need, be very careful you get the right wattage. You're going to need a 15 watt replacement bulb! 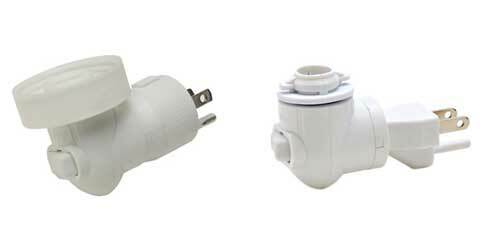 If you tried replacing your bulb but but the night light still won't work, you may need a new Scentsy replacement plug. This is rare but it does happen. If so, you can get a new plug here. The problem with the replacement plugs is, you need to know which of the two different types to buy. We have both, so no worries there and it's not that difficult to differentiate between the two. The glass warmer takes one type and the ceramic take the other. 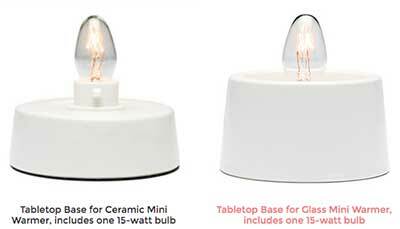 Scentsy now makes Mini tabletop bases that enables you to also use your nightlight warmers as tabletop warmers. We included that in the instructional video above but have a look at the photo to get an idea what we're talking about. This is really cool because there's no need to buy a specific tabletop warmer, especially since most nightlight warmer styles are not available in the tabletop type. The cute little night light warmers are perfect for a bathroom or small room with a power outlet located above the counter. We have seen our customers plug the night light warmer into a low wall outlet, but it's not a good idea if you have kids or curious pets. Scentsy Wickless Candles are simply a better and safer way to enjoy your favorite fragrance. No more worries about blowing out the candle! No more delays when leaving the house because you had to return to double check if you blew out the candles! There's no flame, no wick, no smoke, no soot, no lead! The Scentsy warmers are available in multiple sizes and many designs, sure to fit any home or office decor. If you love candles, you'll love Scentsy!